What can this be? The project is a Rorschach test in a cultural context—a simple shape can be more than a shape when viewer's mind can react to it. The contour of Taiwan is not a manmade border. Created by the moving sea plates over millions of years, its wavy shore line evokes people's imagination. 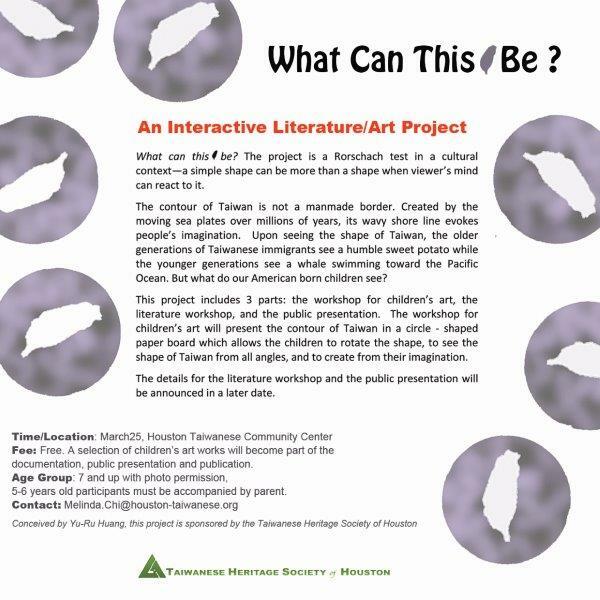 Upon seeing the shape of Taiwan, the older generations of Taiwanese immigrants see a humble sweet potato while the younger generations see a whale swimming toward the Pacific Ocean. But what do our American born children see? This project includes 3 parts: the workshop for children's art, the literature workshop, and the public presentation. The workshop for children's art will present the contour of Taiwan in a circle - shaped paper board which allows the children to rotate the shape, to see the shape of Taiwan from all angles, and to create from their imagination. Kids who are in the afternoon classes have schedule conflict from 3-5pm can take home the template and create art at home for our heritage week display and other publications. They can also speak to these poetry students about their possible creation and bring home a poem to go with their art. Fee: Free. A selection of children's art works will become part of the documentation, public presentation and publication. Age Group: 7 and up with photo permission, 5-6 years old participants must be accompanied by parent.